The Cho Aniki series is known as “that gay Japanese game.” This is an easy assumption to make, considering it blatantly features almost-naked grinning body builders and other references. 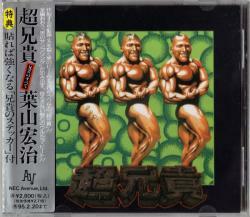 a Cho Aniki – Aniki no Subete (1993), the soundtrack and remix album based on the original game in the series. This is also the only instance I’ve heard where the soundtrack actually sold more than the game itself. “German Jammin'” seems to be Hayama’s favorite song from this game. It’s essentially over-aggrandizement of martial masculinity and mockery of Nazism in particular. Primarily a joke track, it integrates marching and military brass for a kind of drinking song, chanting “DEUTSCH! DEUTSCH! DEUTSCH, DEUTSCH – GEEERRRMAN!” in the over-masculine voice that appears in most music in the series. “German Jammin” appears no less than three times on the album, the first as the BGM track, the second as a remix, and the third as a minute-long piece at the end of the album. InThe Ultimate, Invincible, Most Galactically Powerful Man (1996), the composers used Hayama’s style to great effect. Incidentally, track 1, “The Ultimate, Invincible, Most Powerful Man in the Galaxy” uses the exact same melody as “German Jammin'” (the guy is saying “The Ultimate, Invincible, Most Powerful Man in the Galaxy! !” before the crazy laughter). The remix, “Aniki of the World“, makes fun of everybody. Read the rest of this entry ?